1. Repaint your cabinets. A fresh coat of paint can transform a kitchen from dark and dingy to light and airy. 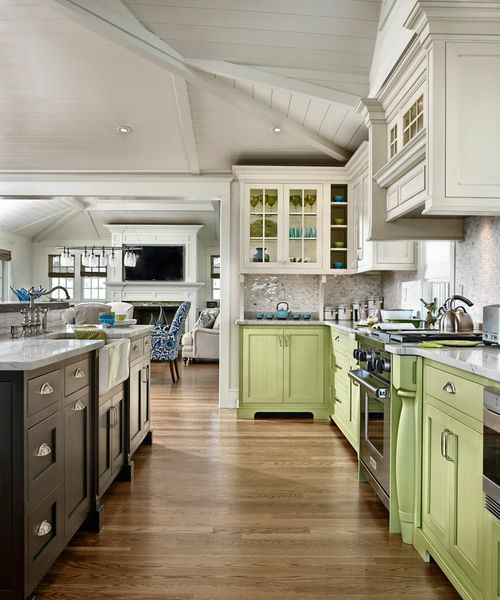 If you are a few years away from that big kitchen renovation, this is a great time to have some fun with color. 2. Upgrade your countertop. 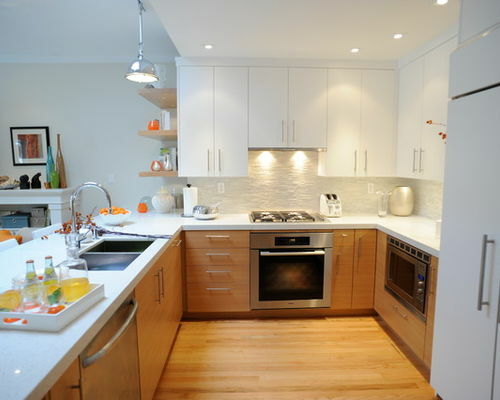 Changing a dated countertop will give new life to your entire kitchenand add immediate value. 3. Install a new backsplash. 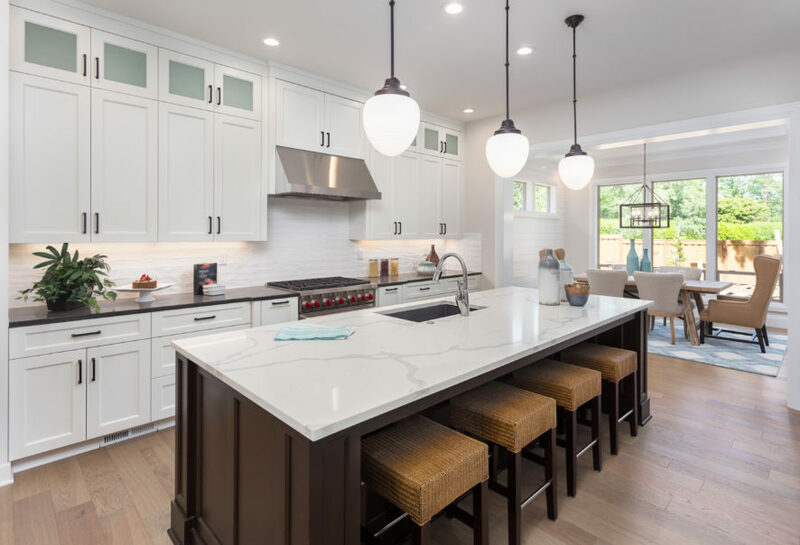 If your cabinetry and countertop work nicely but your room lacks pizzazz, a new backsplash can add loads of personality and really boost your kitchen. A bit of texture, sparkle or gloss will give simple cabinetry plenty of presence. 4. Make a statement. New jewelry always picks up a mood, and it can do wonders for your kitchen, too. New hardware can dress up plain cabinets, while standout lighting fixtures can add a surprising wow factor. 5. 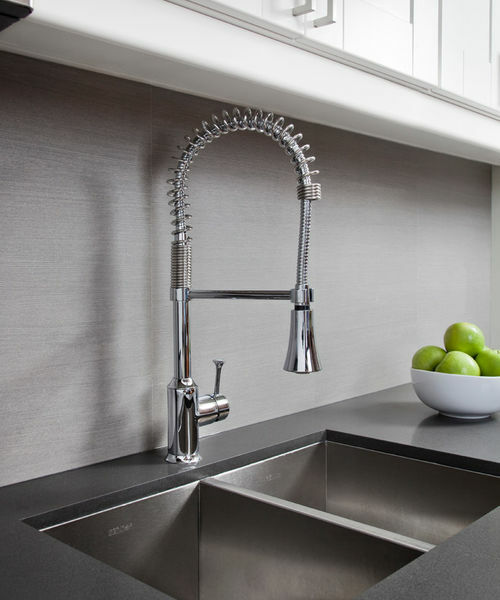 Change your tap fittings. A detachable spray hose comes in handy for so much more than just giving a bath to the toy poodle. Try a spout with a flexible braided water-supply hose. It looks better than a plain black rubber hose and will last longer. 6. Expand your horizons. Need more surface area? You may not need to start from scratch. If you have an island, you can introduce a different material, such as wood, on an added eating counter either below or above the island level. 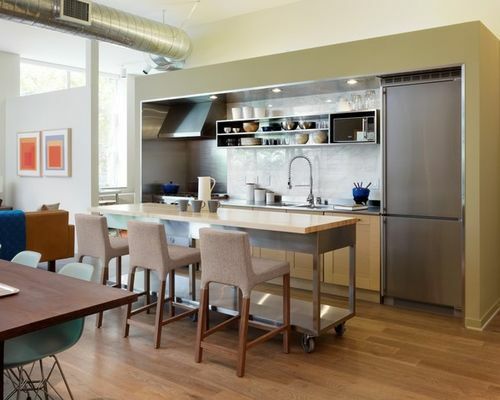 The standard countertop/island height is 900mm. A nice option, like you see here, is to add an extension at dining table height (about 760mm is typical). The great thing about adding an extension like this is that regular kitchen and dining chairs will pull up to the counter comfortably. If you prefer a higher surface, you could opt for bar height (900-1200mm). 7. Consider refacing. New cabinet fronts and doors can provide a welcome facelift if the layout already works and the cabinetry boxes are solid. 8. Rethink the uppers. Open shelving offers an opportunity to display collections or just keep frequently used items accessible. Wine and oil bottles are great for showing off. 9. Add cozy touches. A runner is a great addition to a galley kitchen floor. I don’t know why we are disciplined to treat our kitchen like it has a different set of rules when it comes to decor. For example, I’m all for adding a table lamp for an unexpected element in a kitchen. 10. 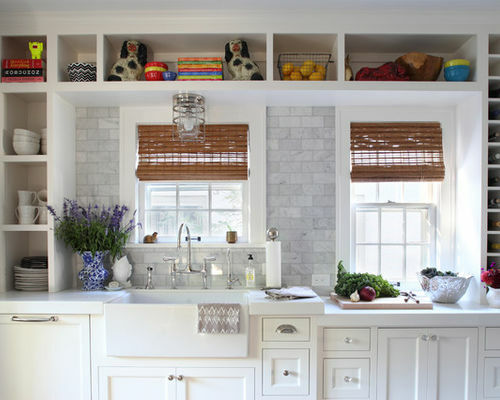 Add a floating island.If a new bank of cabinetry is beyond the budget, try a ready-made freestanding piece to add extra storage and a surface for working and eating. Why not add a new top to a freestanding piece of furniture and extend the edge for an eating counter? The minimum overhang would be 25-30cm, but there are a few considerations to note when extending the top. Take care not to shift the balance of weight so much that the piece is unstable (people love to rest their elbows, adding weight to the surface). Also you may need to add brackets to support the overhang. 11. Add a showstopper. 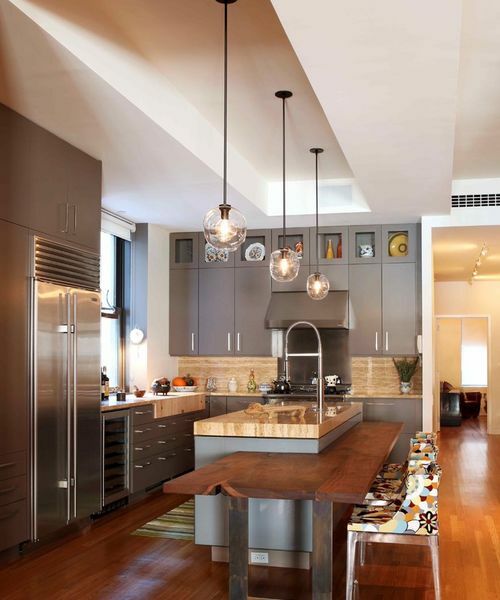 A simple kitchen with simple cabinetry is downplayed by a showpiece range hood. Playing up one feature is a great way to detract from less interesting elements.